On the Caribbean island of Sint Maarten, delivering pizza is far from straightforward. 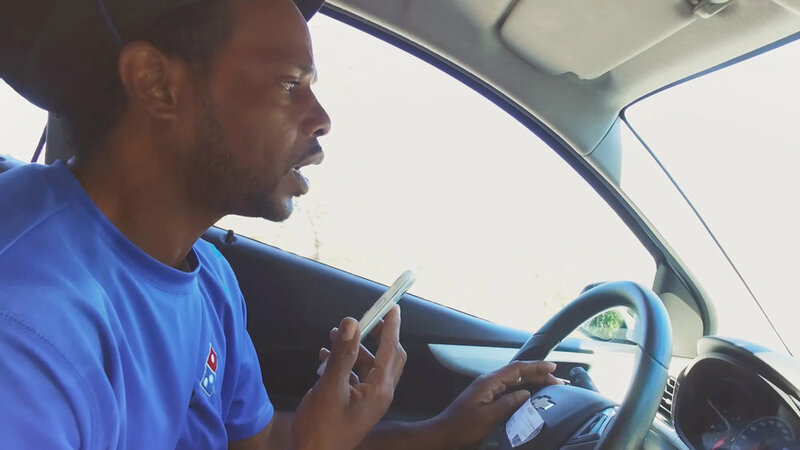 Domino’s delivery drivers face steep roads littered with potholes, aggressive dogs intent on getting their jaws around both the pizza and the driver, torrential tropical storms and Sint Maarten’s famously bad traffic. But once they make it through these obstacles and reach the customer’s neighbourhood, their biggest challenge awaits: finding the right house. John Caputo is the Domino’s Pizza Franchisee for Sint Maarten and an expert on the island’s chaotic addressing system. It’s no wonder his drivers struggle to find customers – houses are often numbered based on the order in which they were built, not their position along the road. On top of this, many buildings are divided into multiple homes, without any signage to direct people to the correct front door. To add to the chaos, when homes were rebuilt after Hurricane Louise in 1995 the local government chose, quite logically, to fix the problem by renumbering the houses. But some residents refuse to accept their new number and continue to use the old one, with many houses still displaying both. Road names are also subject to local dispute, and many signs have fallen into disrepair. Even where signage is good, similarly-named roads placed close together mean that confusion is still common. In the Suckergarden area, for example, every road name is a variety of cactus. The workaround for John’s drivers is to call the customer once they’ve reached the neighbourhood and ask for turn-by-turn directions using gas stations, schools and even mango trees as landmarks. This costs them in phone credit, wastes time and often means multiple phone calls disrupting the customer’s day. As the drivers often say, ‘a hungry customer is a hangry customer’ and when they turn up late after struggling to find a house, they bear the brunt of that anger. This damages both their morale and their tips. They also complete fewer deliveries per shift, meaning less money to take home at the end of the day. Late deliveries also seriously impact workflow and restrict driver supply, as it’s impossible to predict when they will return for the next order. Even in store, poor addresses damage productivity. The majority of orders come in over the phone and time is wasted trying to capture complicated address information, instead of taking the next order, or making the next pizza. With so much at stake, solving the addressing problem has become John’s personal quest. John’s addressing mission goes back an incredible 24 years to his opening of the first Domino’s store on the island. 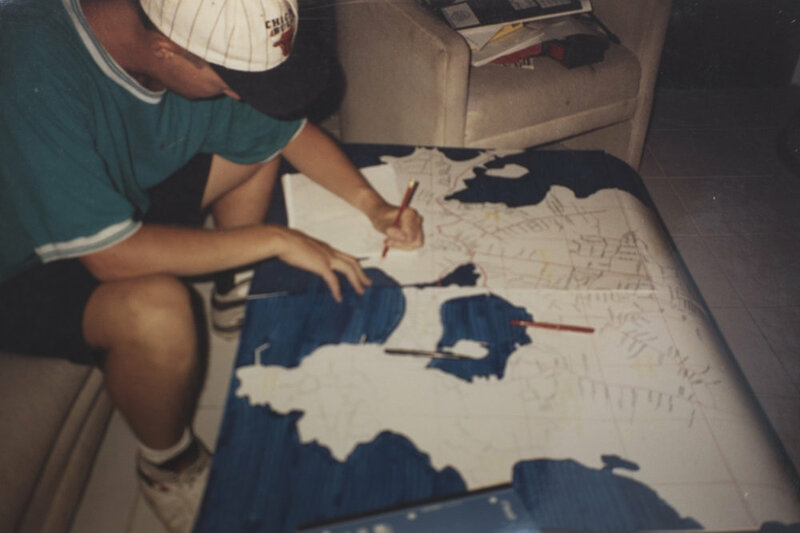 An ambitious and innovative character, he drew the very first street-level map of the island, driving around on his scooter with a notebook and asking people in the street what each road was called. The map hung in his store and proved so useful that even the local ambulance drivers would stop at Domino’s to check it on the way to an emergency. Another idea saw John distributing LED lights to his customers to guide the drivers to the correct doorway, which worked in theory, but in practice relied too heavily on the customers remembering to switch their light on after ordering. Not to be defeated, John was soon pursuing an exciting new idea he’d heard on local radio: what3words. what3words is a global addressing system. It has divided the world into 57 trillion 3m x 3m squares, each with a unique 3 word address. The front door of John’s flagship store, for example, can be found at ///slinging.incriminate.bravado. 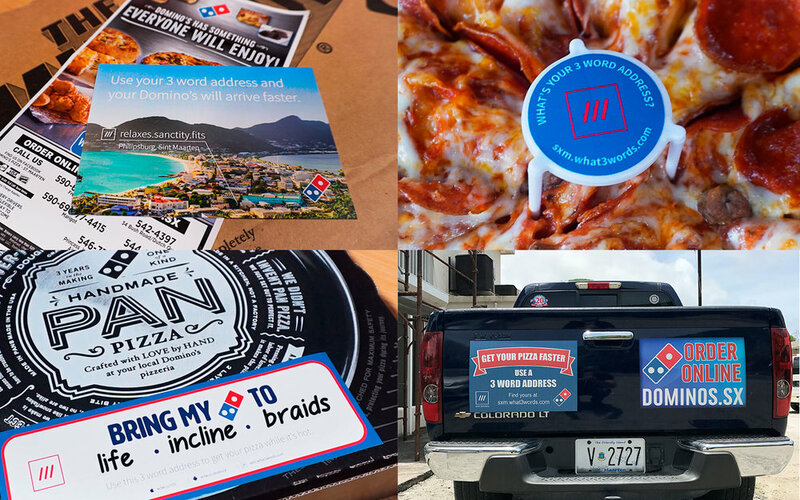 It means that every house on Sint Maarten, as well as every beach chair, now has a reliable and accurate address for pizza delivery that drivers can find first time, every time. John quickly contacted what3words to set up a partnership. 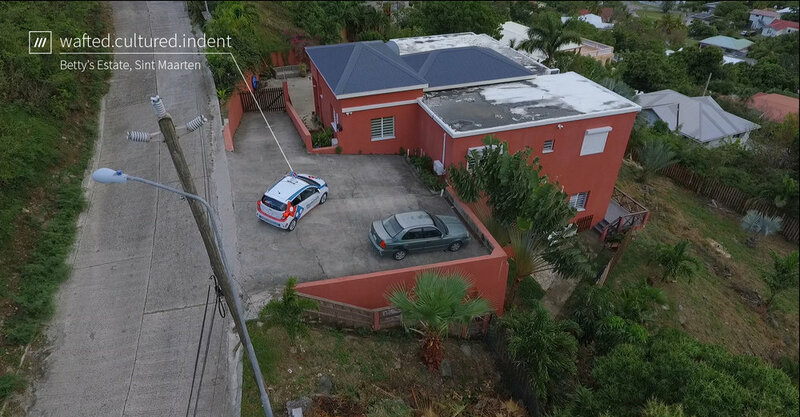 Since then, a custom map site has gone live at sxm.what3words.com to help his customers discover their 3 word address. The map is clipped to the island to make addresses even easier to find. The word is being spread to customers via online banners, radio ads and printed fliers, stickers and pizza savers. Sint Maarten may be a unique island, but John’s delivery problems are shared by business owners worldwide. Even in London, one of the world’s best addressed cities, 3 word addresses have been shown to significantly increase delivery efficiency. They’re also being used across the world to reach people faster and more efficiently, directing couriers, postal workers and even emergency services to precise locations. what3words is a global grid of 3m x 3m squares where each square has been pre-allocated a fixed and unique 3 word address. 75% of the world suffers from inconsistent, complicated or inadequate addressing systems. It means that in remote locations water facilities can’t be found, monitored and fixed; and schools, refugee camps and informal settlements remain unaddressed. Even in countries with advanced systems, people get lost, packages aren’t delivered and businesses aren’t found. Poor addressing is costly & annoying in developed countries, but limits growth and threatens lives in developing ones. Our API is being integrated into businesses, apps & services. It works across all platforms and devices, in multiple languages, offline and with voice recognition. what3words means everyone and everywhere now has an address. In the spirit of the holidays, here’s a little present – a what3words photo app to label your photos with a 3 word address. Danish postal solutions provider Lyngsoe Systems and what3words have developed a new solution that can scan 3 word addresses to dramatically improve the manual postal sorting process. Just a few days ago, a magnitude 7.1 earthquake rocked Mexico City and the neighbouring states of Morelos, Puebla, Guerrero and Oaxaca causing extensive damage and hundreds of fatalities. what3words is being used to help-coordinate a response. The luxury car manufacturer has built what3words into their next generation infotainment system launching next year. Drivers will be able to type or say 3 words to pinpoint an exact destination anywhere in the world. NIPOST will use what3words to increase the number of homes it can deliver to and improve delivery services in preparation for the takeoff of Nigerian e-commerce.